I’m so excited to share this with you. It is my favorite soup right now, and one of my favorite recipes so far this year. It’s interesting to see which posts get tons and tons of traffic and which ones get ignored, because really, you never know. My highest trafficked post isn’t even in my top twenty favorites. My most popular post, Inside Out Caramel Apples, makes me cringe a bit. Although it has been pinned about 200,000 times and shared on Facebook and Twitter thousands more, I don’t really love it. It was posted about a year ago, and there seems to be mixed results with success. As a blogger, that’s hard. I want everyone to have a home run every time they make the recipe, and that one seems to be hit or miss. I hate that. And I hate that I have no idea why it fails for some people, and works for others. And sometimes, the recipes that I love and can’t wait to share, get ignored. You just never know what is going to be a runaway pinterest hit, and what is going to get nothing more than a passing glance. But this soup, I LOVE this soup, and I hope you do too. Seriously, I’m going to make it again this week. Cut the tip of the head of garlic, exposing the tops of the cloves. Place on a small sheet of aluminum foil, drizzle with 1 tbs olive oil. Fold foil around garlic to form a tight package. Cut the butternut squash in half. Scoop out the seeds. Place on a baking sheet. Place garlic package on the baking sheet as well. Roast at 425 for 25 minutes, remove the garlic and allow to cool. Continue to roast the butternut squash for an additional 20 to 30 minutes (45 to 55 minutes total) or until flesh is soft and easy to scoop out. Scoop out flesh (should be about 5 cups) and puree in a food processor until smooth. In a large pot or dutch oven, add the shallots and olive oil over medium heat. Caramelize the shallots over medium heat, stirring occasional, for about 10 minutes, or until a dark golden brown. Don't cook over high heat or the shallots will burn. Add the chicken broth, water, butternut puree, salt, pepper and cayenne. Squeeze the soft garlic head until the cloves push out (should be soft and mushy) add cloves to the soup. Bring soup to a boil, then reduce heat and to maintain a simmer until slightly thickened, about 10 minutes. Remove from heat, add cream and stir. Scoop into bowls, garnish with pomegranate and goat cheese. I have the same sentiments, it’s so dissapointing when I share a recipe that I loved so much but doesn’t get much attention. I guess that why each of us blog our own things. But I do love this soup. The goat cheese and pomegranate…amazing against the butternut. and I love how full that bowl is! Love it, Jackie! That is a great idea Jackie, that I never would have thought of! Thanks! I love this bisque —mmm, so smooth! And love the serving bowl and the pom seeds and the goat cheese. Fabulous all around! 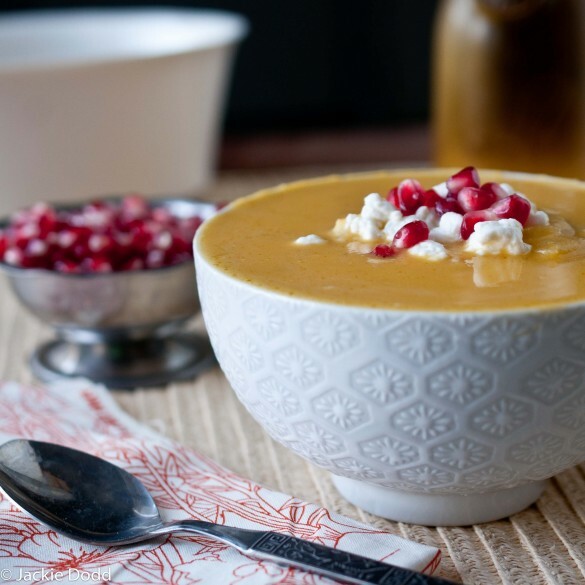 I love soup and this butternut bisque seems so creamy and rich. Totally drool worthy. Amazing soup, Jackie! 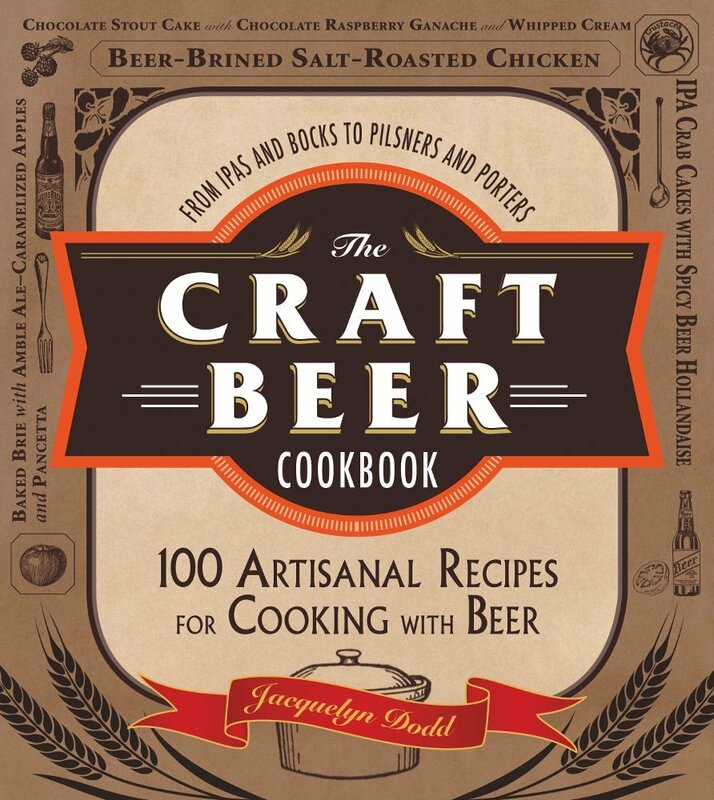 Even though it’s going to be 90 in the valley this weekend, I totally want to make this! I know! I keep pretending like it’s fall, even though the LA weather disagrees with me. i want to ladle this soup in a bread bowl and gobble it up. this looks amazing! A bread bowl would be perfect with this! Love the toppings! And yeah I have that issue. I wouldn’t say I dislike my by-far-most-popular post, but it is for my grandma’s very midwest beef and noodles recipe whereas the majority of my blog is cookies, cakes, and international food with an emphasis on curries lol. I always wonder if the people who end up there after searching end up scratching their heads! What a gorgeous soup! It is funny which posts end up being the most popular – and it’s impossible to predict! 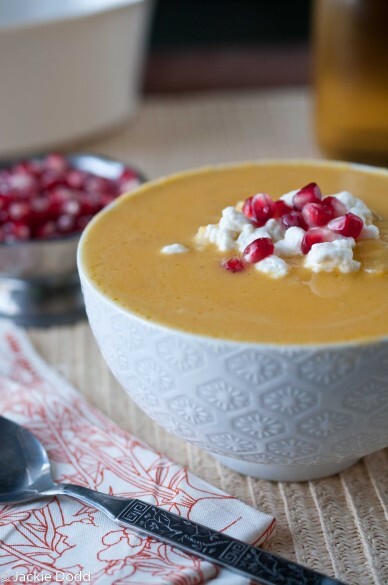 This is totally my kind of soup, I can’t wait to get my hands on pomegranates this season, that colour from the arils just immediately makes me happy. It was so good! I was surprised at how well the slight bitterness of the pom seeds went with the creamy soup. I’m so in love with it now. Do you think it would turn out ok if I used acorn squash? I like butternut, but I have an acorn squash sitting on my counter that’s begging to be used. I think a half and half would be great. Making a “winter squash” soup with acorn and butternut sounds really good. You soup looks great. I’ll have to give it a try. I like that I don’t have to put hot soup in the blender because that scares me. I have had soup burn my hands before. I like that you made the puree first, and then put it in the soup. Yeah, me too. I have a bad history with trying to puree hot soup in the blender which is how this method came about! I can totally see why you love this soup. It’s thick and creamy and the flavors are just exquisite – lovely recipe, J! it’s almost kind of sad how excited I am about this soup! Love love love these flavors! This looks amazing. this is amazing!!!!! i love that you used pomegranate seeds! hi!I really like your writing and your photos and your recipes alot. Thank you for this soup, looks great. Great Fall recipe! The garnish on top is both beautiful and adds the perfect tang with the goat cheese and pomegranate seeds! Wow, that bowl is absolutely brimming with deliciousness! I have the same experience with my recipes. Some of the ones that I think will be a huge hit end up being ignored; once I think will be ignored end up getting tons of traffic. Strange how that all works. And I have had the same experience with people getting mixed results with my most popular recipe. It’s my vanilla ice. I make it all the time, tons of other people have made it, and it’s fine. But every once in a while, I’ll get an email or comment saying that they curdled. It makes me feel so crappy! The pomegranate and goat cheese make such a beautiful garnish! I couldn’t have asked for a better soup. So good and the pom and goat cheese were so much more amazing than I had imagined. Love this so much! I have so much butternut squash sitting on my counter right now – this will be our dinner tomorrow night!!! Sounds amazing! I love all these ingredients, so I’m excited to try it! A couple of questions. Do you leave the “skin” on the garlic when you’re roasting it? Where do I buy pomegranate seeds? You can peel a bit of the white skin off the garlic, but most of it stays on. Just chop it’s little point off, pour on some olive oil, wrap in foil and roast. You are going to love roasted garlic! I buy pom seeds in the produce section. PomWonderful sells them in packages. Or, you can just seed a pomegranate. but that can get messy. I have made this several times to rave reviews. The Critic is not a fan of winter squash, but loves this recipe if I serve it with feta cheese on top instead of goat cheese. I like to puree the roasted garlic in with the butternut. Thank you so much for a wonderful recipe!